Vienna, Austria Panic ensued at the Vienna Airport when an American tourist traveling back to the US from Austria attempted to bring a WWII UXO home. The unidentified 24-year-old told local authorities she found the shell on a hike. A bomb disposal unit was called in when she attempted to take the shell through customs. A portion of the arrivals and luggage section of the airport was shut down during the response. She reportedly explained to authorities that after she found it, she took it back to her hotel room and cleaned it off so it wouldn't get her clothes dirty in her luggage. London, Ontario An EOD unit from the Canadian Forces was called in by police after a homeowner left a live artillery shell out with the trash. The UXO (pictured below) was found by a local resident who noticed the bomb on his way to a doctor's appointment. Walters, Oklahoma An EOD team from Fort Sill responded to the Cotton County Sheriff's Office after a farmer dropped off a military UXO at the station. The parking lot of the sheriff's office and courthouse were evacuated and the area cordoned off as the team arrived to take possession of the round, believed to be a WWI smoke round. The farmer and others in the community were reminded to leave potential explosive devices in place and contact authorities. 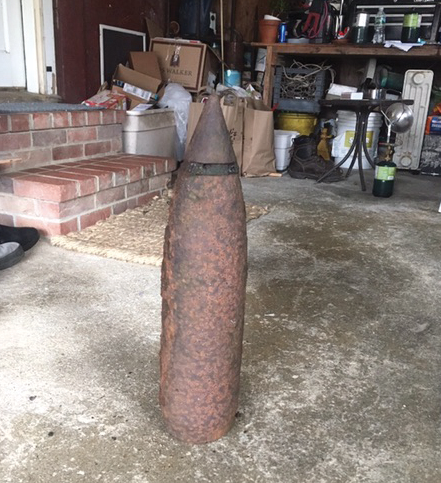 Nantucket, Massachusetts Two residents described by police as young men found a UXO item at the Sconset dump. The two reportedly transported the item to a house on Vestal Street before calling police to report the find. Police responded and took custody of the item until Navy EOD arrived the following day to safely dispose of the item shown below. Kalihi, Hawaii A woman in Hawaii discovered a munition items on her property, and instead of notifying authorities, personally delivered it to the Kalihi Fire Department (KFD). Fire fighters on scene were unable to determine if the device was live not. The KFD called in the local bomb squad who resolved to take the munition away from the fire station for safe disposal. In their report of the incident, the KFD reminded the public that all suspected ordnance should be reported so that it can be handled by the appropriate authorities. They say that when discovering any type of ordnance or suspected ordnance, citizens should contact their local police immediately and never attempt to move the item. Tularosa, New Mexico While breaking down an old trailer, a New Mexico man came across a strange device. Thinking it was an old grenade of some type, he brought the suspect object to his local police department. The Tularosa police then called the State Police and asked for a bomb technician to come examine the object. The technician determined that it was not a grenade but more likely an old smoke device of some kind. The item was taken off site to be x-rayed and properly disposed of. Cagayan de Oro City, Philippines Fishermen off the coast of Cagayan de Oro City hauled in more than they were expecting when they came across two large metal objects while out fishing. Believing the metal to be scrap, the fishermen dragged the metal into their boat, hoping to sell the metal to make some extra money. 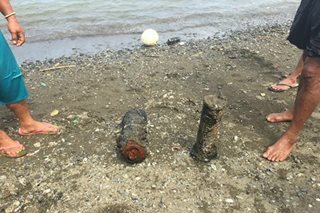 Upon closer inspection, however, the fishermen could tell the metal objects looked like they might be explosives and reported the find to authorities. The Cagayan de Oro City Police Office EOD unit examined the metal objects and found them to be UXO, likely from the WWII era. The area the fishermen had found the objects in was a dock for American soldiers during WWII and the EOD team believes that more UXO may be present in that area. EOD stressed that in similar circumstances, civilians should not touch or move similar objects, and should report them to authorities to be cleared before attempting to move them. Fraserburgh, Scotland A munition item was discovered by a Fraserburgh citizen, who immediately brought it to the police station. Calling upon the Army EOD team, the police worked alongside the EOD team to investigate the device. EOD determined that the munition dated back to WWI and determined that it should be detonated. The device was transported to a Fraserburgh beach by EOD where it was safely detonated. Zamboanga City, Philippines Eight people died in a UXO explosion in the Philippines. According to officials, a 21-year-old man, Marcelo Antogan, found a rusty mortar in a local river and took it to an open field to tinker with. Believing there may be gold or other valuables inside, the man began attempting to open the UXO. Using a hammer and repeatedly hitting the device, Antogan accidentally set off the explosive. The detonation killed six people at the scene, and two more victims died from injuries in the hospital. Five others were injured and were hospitalized for their subsequent injuries. It is unknown whether the mortar was a WWII relic or a more recent explosive from fighting between the government and Muslim rebels.